Read together the examples on the Anonymous passives sheet and ask the children, in pairs, to discuss where these might be found and how they are effective. 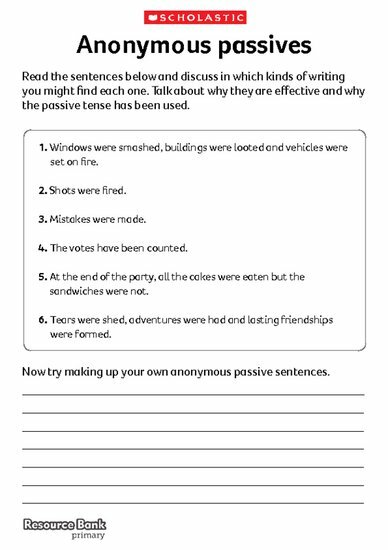 Ask the children to come up with some similar examples of passive sentences of their own, where the person who did the action is not known or not revealed. Primary members of the Scholastic Resource Bank can get instant access to this activity sheet and thousands more online resources. Our finely crafted resources include lesson plans, teaching ideas, planning and assessment tools, activity sheets, interactives and video.